The FDA has approved Nivolumab (Opdivo™) for the treatment of patients with previously treated metastatic squamous non-small cell lung cancer (NSCLC). Nivolumab is the first and only PD-1 (programmed death receptor-1) therapy to demonstrate overall survival in previously treated metastatic squamous NSCLC. Suresh S. Ramalingam, MD, professor and director of medical oncology at Winship Cancer Institute of Emory University, served as the principal investigator of the Checkmate 063 study, which was one of the two clinical trials that formed the basis for the FDA approval. Several patients were enrolled in the trial at Winship. 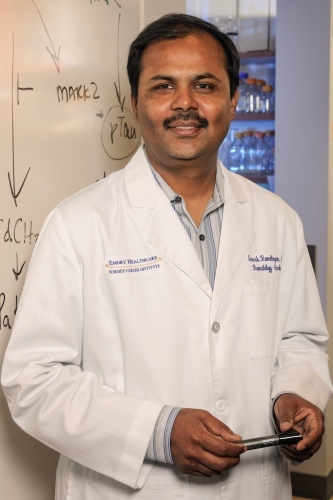 Ramalingam says "The FDA approval of Nivolumab introduces an entirely new treatment modality that has demonstrated unprecedented results for the treatment of previously treated metastatic squamous NSCLC, with the potential to replace chemotherapy for these patients. This milestone brings to fruition the long-held hope that immuno-oncology medicines can be significantly effective in this difficult-to-treat population."